Like a lot of people, I’m a huge fan of Michael Lewis. Last summer, I read his newest book, Flash Boys, in a delirious, happy haze. That book made my Top Ten Best Books list of 2014. 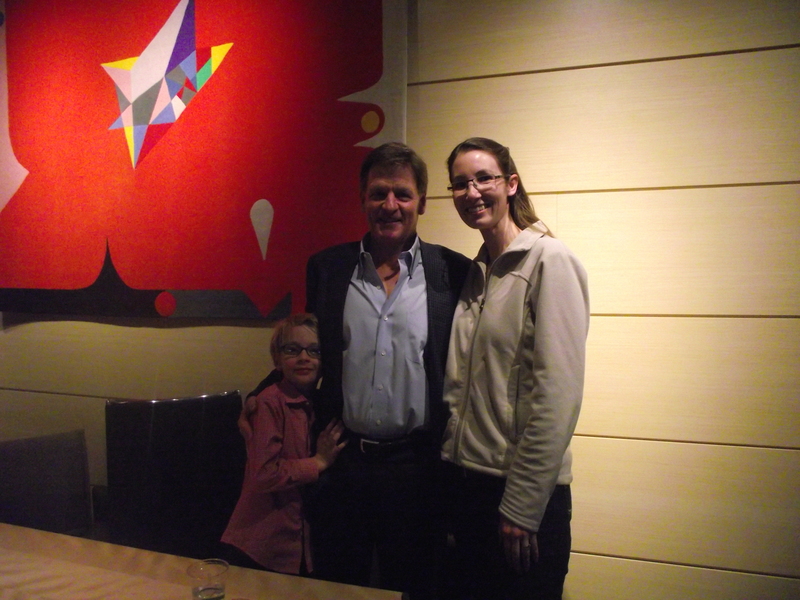 This year, on March 12, I had the privilege of meeting Michael Lewis in Aspen, Colorado. My Crazy Babe friend Adriana went with me, and she took pictures — so I have proof that yes, I met — and touched!! — Michael Lewis. 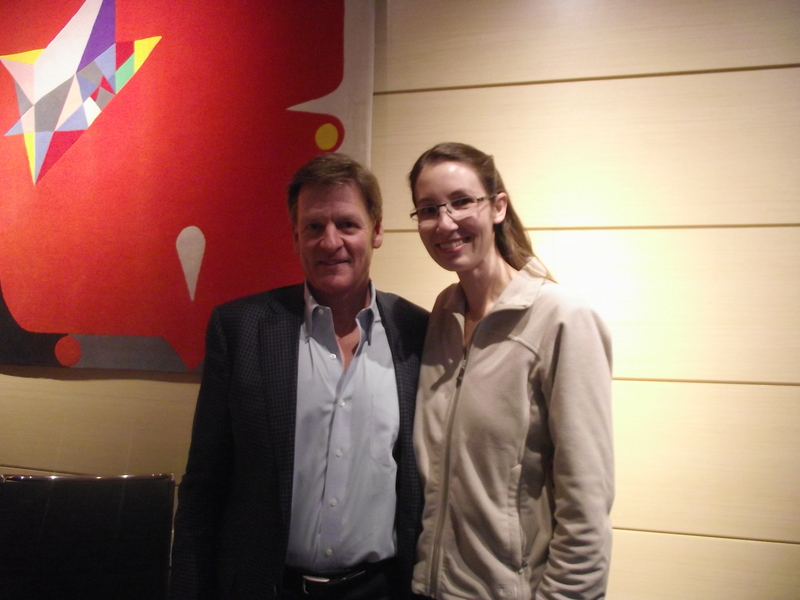 When Adriana went outside to get her camera, I actually spoke to Michael Lewis — an exchange I had to keep very brief, because I almost burst into those super embarrassing, oh-my-god-I’m-meeting-my-hero tears. I blame my lack of control on getting old and being unable to deal with the overwhelm. When I met Michael Ondaatje, I couldn’t even talk. I shook his hand and ran away. When I met Laini Taylor, I had blubber-eyes. With Michael Lewis, I had to leave the table, pace around in the lobby a while, then Adriana came back inside and I was okay. Aspen has an independent bookstore, Explore Booksellers, that has been in business for as many years as I’ve been going to Aspen. I’ve purchased many, many books from that shop, and on March 12, I bought a copy of The Big Short: Inside the Doomsday Machine. I’d been wanting to read this book for a long time, and that time finally arrived this summer. 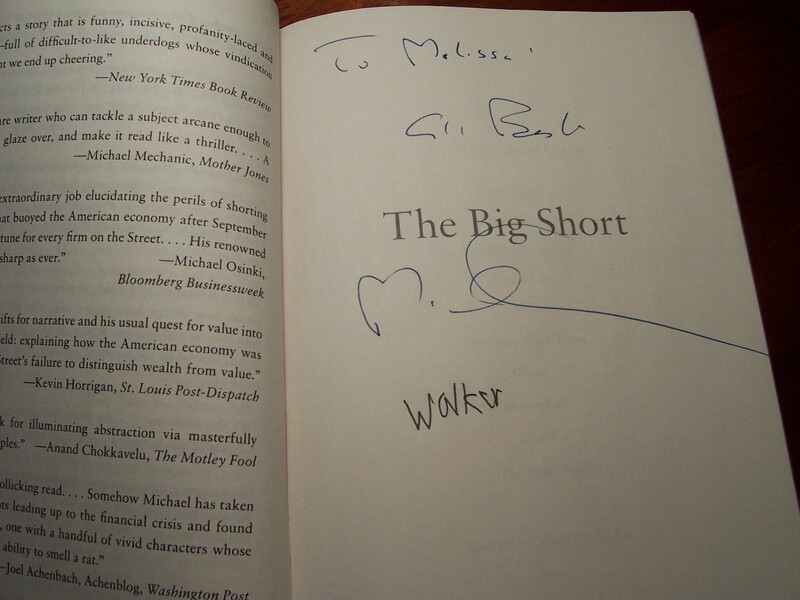 I love all of Michael Lewis’s books — and last week, I spent a fabulously long day reading The Big Short. I also watched several interviews Michael Lewis gave right after this book was published, which details events leading up to the financial collapse of 2008 — what caused it, and the people who saw the catastrophe coming and made a lot of money off the ridiculousness that was “the housing boom” (i.e. the subprime mortgage craze, i.e. sheer lunacy). I’ve read a lot of books about the collapse, but The Big Short provided insights I’ve never found elsewhere. I highly, highly recommend this book to anyone who hasn’t read it yet. The Big Short will be coming out as a movie in 2016. As I learned on March 12, Brad Pitt bought the film options right after the book came out in 2010. According to the cast list online, Brad Pitt plays Ben Hockett, Christian Bale plays the one-eyed genius Michael Burry, Ryan Gosling plays smart-gutsy-guy Greg Lippmann, and Steve Carell is playing the straight-talking Steve Eisman. All those actors are playing real people — really *awesome* people — and oh my goodness, I cannot wait to see this film!! It’s going to be so good!! So so good!!! Doesn’t Michael Lewis have such a swirly signature? I would never have guessed he’d make his initials so loopy. There are few joys in life so great as seeing your name written by the hand of an author you love. Whenever I see the words, To Melissa, followed by the signature of Michael Lewis, something inside me starts screaming in bliss. My inner fangirl is just beyond.